Rated among the best national parks in India to possess the ample counts of Asian tiger species, the Bandhavgarh National Park receives millions of accola des from international wildlife lovers. By spreading at an area of 448 sq km with a buffer area of approximately 400 sq km, the Bandhavgarh National Park nestles in the Vindhya Ranges in Madhya Pradesh state. It is the land of the tigers where the vicinity may look stranger to you but the residents- the wild species are much friendly to everyone. Bandhavgarh Reserve, featured with a millennium old fort, tropical forests and woodlands, steep rocky hills and grassland valleys, brings one of the most dramatic landscapes in the country. Located in Umaria district in Madhya Pradesh in the Vindhya ranges of the Bandhavgarh Hill at an altitude of 811 m above the sea level, there lays the supreme land of the tigers the Bandhavgarh National Park. Bandhavgarh boasts astounding varieties of trees and foliages, with almost half the park's area covered with fine trees and hushy-bushy shrubs. The top of the hills are carpeted with mixed forests, while beautiful stretches of bamboo and grasslands spreading across the north illuminates the whole ambience. Bandhavgarh is popularly known across the world for its dense tigers' population since it has been declared as national park in the year 1968. But there's much more to see besides the tigers and leopards. Chital (spotted deer), Sambar deer, dhole, nilgai, wild boar, chinkara, sloth bear, rhesus macaque, black faced langur, jungle cat, hyena, porcupine, jackal, fox and wild dog also inhabit in its forests. The Bandhavgarh National park is singularly known for the highest density of Bengal tigers in the vicinity. They have been specified with unique names to identify in the dense jungles and are known in the world. Out of all those individual species, Charger is the first healthy male known to be living in Bandhavgarh since 1990s and is being named so because of his habit of charging at elephants and tourists (whom he nonetheless did not harm). A female called Sita is considered as the most photographed tiger in the world and also appeared on the cover of National Geographic. Today, almost all the tigers are descendent of Sita and Charger and both the tigers along with other famous tigers are considered not more than as the celebrities of Bandhavgarh. Some of them like Mohini, Langru and B2 have known much for their frequent sightings and moving closer to the tourist jeeps. Today, the most prominent tiger in Bandhavgarh National Park is Bamera, who has territory in all the four zones of the park. The female species are Kankatti and Panpatti who both have three and two cubs respectively. The climatic conditi0ons of this tigers' land vary in extreme conditions like in winters the tourists are bound to put on multi-layer of protection to face the bitter cold. Mornings are extremely pleasant but once the impact of sun rays lowers down, the weather is extremely ferocious to face the chilly winds with the temperature ranges of 45°C to 30°C. Monsoons can be witnessed in between 1st July to 15th of October, when the reserve is remained closed for normal visiting with an average rainfall of 1200 mm. And quite opposite the summers change so drastically that it goes maximum temperature of 48° C.
Rail Connectivity : the closest station is the Umaria Railway Station. And the location is well connected with Agra and Delhi. 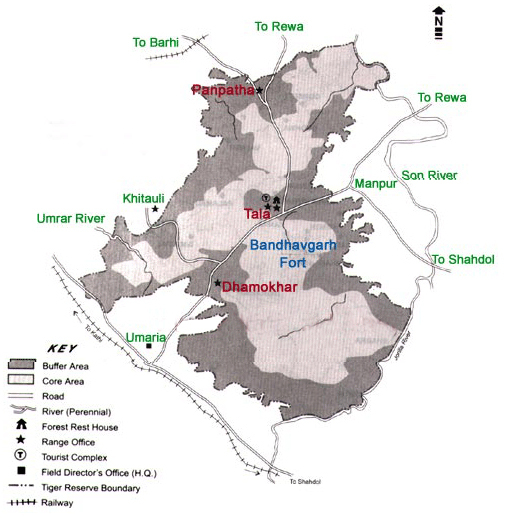 Tala (Bandhavgarh) is well connected to Katni which is one of the major railway junctions nearby. Road Connectivity : Umaria can be accessed through a jeep ride from Tala, the village at the Main Gate to Bandhavgarh. It takes 2-2.5 hrs and you can easily get vehicles to and from the station by jeeps or similar vehicles waiting at the exit of the Umaria railway station. The Natural Heritage Resort is nestled among the hills of Madhya Pradesh, near the Bandhavgarh National Park. The Resort has luxury cottages with attached baths and a set in the midst of 3 acres of mature forest. Located within walking distance of Bandhavgarh National Park's main gate, the lodge had been developed on the theme of an Indian village, with twelve thatched twin-bedded cottages around an innercourtyard. Maharaja Royal Retreat Bandhavgarh is owned by the Maharaja of Rewa used to be the hunting lodge of royal family. Maharaja's Royal Retreat is a throwback to the royal past with guests. Mogli Jungle Resort is located at tala village, 02 km from Bandhavgarh National Park Resorts is lies on 16 acre of lush green forest adjoining perennial river charanganga. Kings lodge is spread in a sprawling estate of 12 acres in Rancha village (8-10 minutes from the park gate) and is surrounded by Sal forested hills on all sides. Nestled in the vicinity of the breathtaking Bandhavgarh National Park is the first of the Taj Safaris Lodges. The name Mahua Kothi draws inspiration from one of India's most beautiful trees, the Madhuca Indica. Wild Haven Resort is located about a kilometer away from the main entrance gate of Bandhavgarh tiger reserve. It has convenient access from the road on which the township of Tala is situated. The 5 exclusive Tree houses are spread in a dense jungle of 21 acres merging into the jungles of finest tiger reserves of the world. It is not uncommon to spot animals from the privacy of ones balconies which overlook the tiger reserve and the Bandhavgarh Fort. Bagh Sarai are proud to announce that we are going to be blessed by our loveable and famous elephant "Kanchi" featured in the National Geographic film "Elephant Vision" . Anant Van fulfils a cherished dream. The latest avatar of Churhat Kothi, it’s a wildlife camp with a difference: a small farm at the edge of Bandhavgarh where we have begun a reforestation program, to sustain the delicate ecological balance of our park.
" The resort offers 21 rooms which includes 10 independent cottages with a private machan, 01 tent and 10 deluxe rooms with all modern amenities". Nestled among the picturesque Vindhya Hills and surrounded by the natural beauty of the wild Banda Garh Tiger Reserve. Bandhav Vilas is a five star luxury jungle resort situated on the border of the reserve. The mean annual rainfall is 1,173 mm coming mostly in the rainy season (middle June to September). The temperature ranges from a maximum of 42 C (42 degree Celcious) in May and June to around 4 C (4 degree Celcious) in winter, Casual Summer clothing of natural colors is best from March to May. Sunglasses and sunhats are preferable. From November to February carry warm clothing for chilly mornings and misty evenings. The ideal season for tiger spotting is from November to June. The park is closed form July 1 to September 30.
you should carry with you to Bandhavgarh are totally opposite depending on the season in which you are visiting it. The summers are blisteringly hot and don't expect any let up while you are there. You should expect unrelenting heat day after day if you are there between the months of April and June. With temperatures soaring between 35 and 47 degrees centigrade most of the day, even the lightest of T-shirts feel like warm jackets. Take along your lightest clothes in the summers with the definite inclusion of a cap and dark glasses. In the winter months, especially November to beginning February, the weather is just the opposite. Khajuraho: 270 km/ 6 hrs. Jabalpur: 190 km/ 4 hrs. By Air: Fly from Delhi, Agra or Varanasi to Khajuraho and drive (7-8 hours) to Tala park entrance at Bandhavgarh. Nearest airport from the park is Khajuraho. By Rail: Nearest railway station is Umaria after Katni railway station from there it is about 40 minutes drive to Nature Heritage. Alternatively, take the overnight train from Delhi to Umaria and drive (30 minutes) to the park. Only jeeps are available for transfers. Khajuraho / Bandhavgarh distance is 250 Kms, (8 hrs drive).